Success Strategies for Women in Science: A Portable Mentor focuses on a wealth of knowledge and years of experience of successful female scientists from industry, government, research institutes, and academe. This book, through practical advice and real-life stories, presents what knowledge and skills are needed to make the transition from trainee to scientist that, if practiced, will help beginners become successful. This book, in particular, describes the essential skills required of every researcher, such as networking, communicating, coping with the demands of a research career, time management, and the most difficult of skills, saying ""no"" to excessive demands on time. This text also explores the issues relating to career development and the importance of the examination of alternate career paths. While much of the advice in this mentoring manual is aimed at women new in their careers, experienced readers will also find the book of value. This material will fill the gap and help women to pursue excellence and achieve success in their chosen scientific careers. 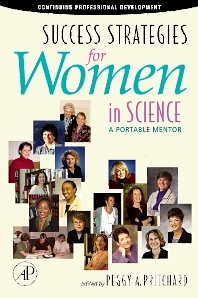 An invaluable resource not only for women scientists, mid-career and senior scientists, of both sexes, involved in mentoring female graduate students, doctoral fellows and younger colleagues, career/guidance counsellors in secondary schools and colleges/universities, but also for parents who want to support and encourage their daughters' interest in careers in science. Peggy A. Pritchard is a career information specialist and academic librarian highly experienced in designing and delivering innovative curricula to foster the development of a range of academic literacies and professional competencies. In her current position at the University of Guelph (Canada) she works collaboratively with faculty colleagues, educational developers, and writing and learning specialists to support undergraduate students in science, technology, engineering and mathematics (STEM) and Psychology. She has been formally recognized for excellence in undergraduate and graduate teaching at two top-tier universities in Canada.